The city has innumerable streets that have countless luxury brands, and is filled with eye candies for Shopaholics. While shopping here may not be so cheap, it is definitely an experience worth having if you wish to glam up your wardrobe or home! So, the next time you take a trip to England, make sure you check out these best places to shop in London, especially after a Top Sights Tour. For serious fashionistas, Bond Street is the place to be seen in and to shop. Bond Street – formed of New and Old Bond Street – boasts one of the biggest and best concentrations of designer shops in the world, including Donna Karan, Prada, Louis Vuitton, Chanel, Nicole Fahri, Armani, Versace and Ralph Lauren. Quintessentially English style can be found at Mulberry and Burberry’s flagship stores. Bond Street also plays host to Sotheby’s auction house and a number of antique stores and markets have popped up in the area. If you or your other half has a thing for diamonds, you should know that Cartier, Tiffany and Asprey are among the many very exclusive (ie expensive) jewellers on this exclusive, expensive street. New Bond Street is a few minutes walk from Bond Street Station and is linked up by the pedestrian-only South Molton Street. Old Bond Street is the short section at the southern end which joins Piccadilly. Nearest Tube: White City or Shepherd’s Bush for Westfield London, and Stratford for Westfield Stratford City. 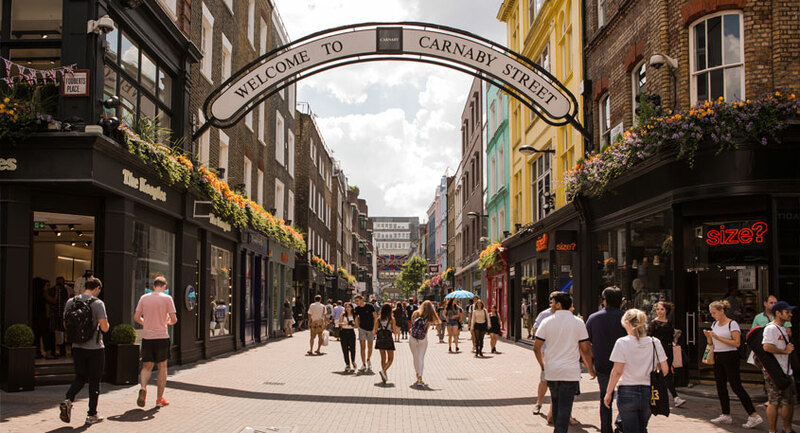 The birthplace of the fashion and cultural revolution during the Swinging 60s, the 13 streets that make up Carnaby are located between Oxford Street and Regent Street, and feature more than 100 brands and 60 restaurants, bars, cafes and pubs. Step under the iconic arch to find an intriguing mix of independent boutiques, heritage brands and new designer names, as well as a choice of cafes, restaurants, bars and great English pubs. Refuel at restaurant hub Kingly Court, just off Carnaby Street. A visit to Covent Garden is a must, whether you intend to shop, sightsee or soak in the carnival atmosphere. The focal point of Covent Garden, the market, has dominated the area ever since the Middle Ages when monks tended their market garden here. Since the 19th century the market has expanded. Watch out for mime artists – harmless but irritating. The Garden is a mecca for shop-hoppers because of the variety available here. High Street outlets include Oasis, French Connection, Zara, Urban Outfitters, Hobbs, Marks & Spencer and Mango. Menswear is available at Diesel, Replay, Ted Baker and for the smarter guy, Paul Smith. There are a huge number of women’s fashion stores and Neal Street, which runs out of the Piazza, is probably the best shoe shopping street in the capital, with numerous trendy outlets including Office, Foot Locker and Size. Further options include Neal’s Yard, a quaint and colourful courtyard that’s worth a stroll through and Seven Dials, which is home to yet more high street stores. If you’re still keen to shop remember to pay a visit to the beautiful Apple Store which, located in a carefully restored 1876 building, is spread across numerous floors and makes shopping a thoroughly enjoyable experience. In posh Chelsea’s King’s Road you’ll find an eclectic mix of chic boutiques, unique labels, designer shops and high-street staples, alongside a vast array of cafes and restaurants. It’s also a great place for inspirational interior design, with Peter Jones, Heal’s and Cath Kidston all vying for attention. Be sure to check out Duke of York Square: located just off the King’s Road, this tranquil square is home to more than 30 fashion and lifestyle retailers, including one of Europe’s largest Zara stores. You can also visit the store where punk was born in the 70s, Vivienne Westwood’s shop and a treasure trove of antiques at the Chelsea Antiques Market. Visitors from around the world flock to Knightsbridge and Brompton Road to visit the illustrious shops and department stores. This is the place to go if you’re looking for prestigious brands and up-to-the-minute trends from the world’s fashion elite. Best known for Harrods and Harvey Nichols, you’ll also find big-name fashion designers on Sloane Street, as well as high-street brands such as Topshop opposite Harrods. Known worldwide as the home of bespoke British tailoring, Savile Row is the place to come if you want a handmade suit crafted the old-fashioned way (with a price tag to match). Credited with inventing the tuxedo Henry Poole & Co – also the first Savile Row tailor – is still cutting cloth at No 15. Other big names include Gieves & Hawkes, Huntsman & Sons and Ozwald Boateng. On the corner of this “golden mile” of tailoring you’ll also find the flagship Abercrombie & Fitch store. 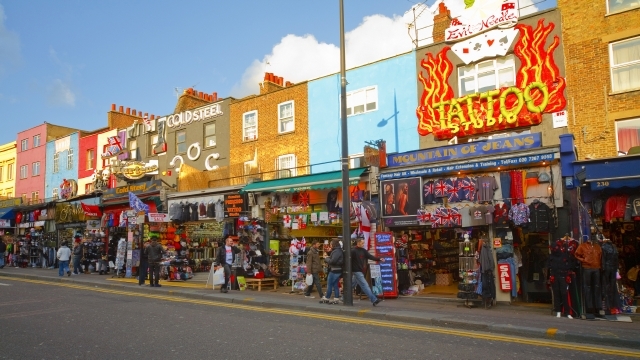 Camden is the ideal shopping destination for lovers of alternative clothing. Here you can find some of the most unusual London shops. Get off the Tube at Camden Town, walk along Camden High Street, and you’ll find plenty of stores selling gothic fashion and punk clothing, alongside tattoo and piercing parlours. Further ahead, Camden Lock Market has it all, whether you are looking for a perfect birthday gift or a souvenir, from hand-crafted jewellery, to vintage leather bags. And don’t miss the futuristic cyber clothing shop Cyberdog. Famous worldwide thanks to the film of the same name, Notting Hill offers a vast array of small, unique shops selling unusual and vintage clothing, rare antiques, quirky gifts, books and organic food. There’s the popular Portobello Road Market – a mile-long (1.6km) street with vibrant stalls set out daily. Nearby Westbourne Grove offers more high-end shopping, with stylish designer shops dotted between a mix of quirky boho boutiques, hip cafes and art galleries.